Bravo (Formerly Delgado) is simply a great dog who quickly found his way into our hearts! He is a wonderful addition to our family. 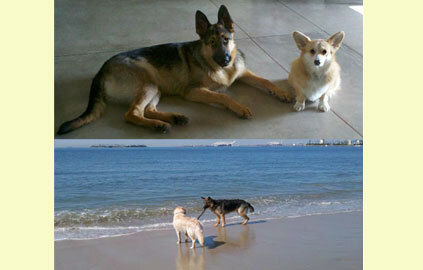 As you can see by the photos, he and our corgi, Nautica, are now good buddies. Once Nautica got used to her BIG brother’s size (he last weighed 100.5 pounds at the vet), she realized that he’s just a big softie! As I said in earlier email, Crossroads training center gave Bravo a great start and I am proud to say that his trainer was very happy with our progress as a team as Bravo graduated basic training with flying colors. Bravo’s favorite activity is the beach! You would think that he is a water dog. He needs no invitation to run into the ocean and play in the waves! We also spend much time hiking/walking and to date, he and I have logged well over 200 miles since we brought him home late February. I couldn’t ask for a better walking/hiking partner. Thanks again for your part in bringing this wonderful dog into our lives.